Winding River Fiber Arts: The Saartje Booties,Bellatrix socks, & LOTR sock club! The Saartje Booties,Bellatrix socks, & LOTR sock club! Here are my finished Saartje booties. I tried to use a colorway that was neither feminine nor masculine, but had great color since it's knit in garter and that always showcases the color bumps. I can't get a good picture of the color, but they're blue, purple and green. They ended up being 3" in length, so they are totally newborn. "One of the Black Sisters, her evilness grates on you like 1000 runs in your stockings"
Here are the toes and start of my Bellatrix socks. I'm actually up to the gusset right now, but I've had a few mishaps. First, my #1 bamboo circular broke (the cable where it connects). So...it was New Years Eve and I had to wait until yesterday to pick up a new needle. I got an Addi Turbo Lace for it. 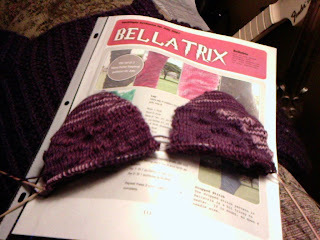 Then, I was just sitting down to knit last night after a long day of crazy kiddo-ness, and my #0 broke. It just broke off at the wooded part where the cable connects. OK. I get it. No more bamboo for socks. I'll use the damn Addi's for now. I'm also going to order the KnitPicks Harmony since they have metal connections and I think they will work with the tiny sizes just fine. So, I'll be heading out to my LYS again today to pick up some Addi Turbos in #0. My Bellatrix socks are totally cursed, but I don't care. They are awesome and I'm going to finish them. I also had a casuality in the manner of my Brittany birch DPN's last night. Morgana was holding two of them pretending to knit and went to sit up off the couch and snapped one right in half. Luckily I had 6 in the set, so there's still 5 should I need them. I'm having a hell of a time with needles the past few days. I don't know what's up. And to end this posting, I was clicking on my groups on Ravelry and I saw a new group "LOTR sock club". I clicked on it and found a cool yarn company called The Unique Sheep that was hosting a LOTR sock club. I was all excited about it as LOTR stuff is harder to find now as everyone in the mainstream is "over" it now. And I think there's only one sock pattern on Ravelry for it (Rivendell). And now, here is a whole club, 6 months long for 2009, with a monthly payment option (affordable! ), and exclusive colorways and patterns that make sock clubs so much fun! All LOTR! Jim even seems to think this is a cool idea. Knitting is so much fun because of the entire Ravelry thing, I swear. So, it looks like it's going to be a busy Spring for me with two sock clubs going on for the first part of 2009. And a new baby. Anyday now. 37 weeks and counting. This pregnancy is not bouncy and spritely like my others...it's wiping me out. I'm ready for the baby to come, I'm ready to have five children and be done with pregnancy in the future. I never knew when I'd hit this point, but I kept telling everyone that I would *know* when it hit. I would *know* when my family was complete (this is in response to the multitude of times I've been asked how many children I'm going to have). I wish I had more time to just sit and ponder over the baby, and enjoy this last little bit of time before they arrive. P.S. Did I mention that I happened to find the LOTR sock club on the very last day of sign-ups? And signed up for it at nearly 9pm without even knowing it was the last day. I would've kicked myself if I had waited until the next day or pondered it a bit more. Well, Jim is home from work, I'd like to snuggle him up a little bit, and then I have to head over and get my needle and a tiny hank of sock yarn for baby.